Mirabilis nyctaginea (Michx. ) MacMill. Stems: Erect or ascending, angled, much-branched, glabrous or slightly pubescent, sometimes waxy; nodes swollen. Leaves: Opposite, simple, on stalks 1/2 to 3 inches long, upper leaves often sessile, ovate to lanceolate, 2 to 5 inches long, 1 to 3 inches wide, mostly glabrous; bases heart-shaped; margins entire; tips pointed or blunt. Inflorescences: Umbel-like clusters of 3-5 flowers, terminal. Flowers: Calyces bell-shaped, pink to reddish purple, about 1/2 inch wide, 5-lobed, lobes united for part of their length; petals absent; stamens 3-5, projecting beyond edges of calyces. Fruits: Dark, narrowly oblong, hard, strongly ribbed, hairy; seeds small, yellowish brown. Habitat: Disturbed areas, woodland edges, thickets, roadsides, and waste areas, most abundant on limestone soils. 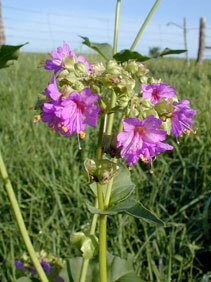 Uses: Native Americans applied a poultice of crushed root to boils, strained muscles, and burns. Dried roots were ground and applied to infant's sore mouths. The roots were boiled and the liquid taken for fevers and to expel internal parasites. The leaves were smoked like tobacco. Comments: After pollination, the calyces fall and the subtending, 5-lobed, leafy bracts enclose the fruits. "Four-o'clock" refers to the flowers opening in late afternoon and "umbrellawort" refers to the overhanging bracts that resemble an umbrella. Wild four-o'clock is related to bougainvillea.